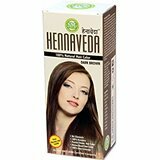 The Hennaveda Dark Brown Hair Color is made using several Indian herbs and it guarantees nourishment and natural coloring. The Hennaveda Dark Brown Hair Color is a 100% natural and chemical free hair color offering complete hair care. There is no PPD in the Hennaveda Dark Brown Hair Color and it causes no skin reactions and allergies. At least 3-4 applications of the Hennaveda Dark Brown Hair Color lead to proper results. We are a highly acclaimed Manufacturer, Exporter, and Supplier of Hennaveda Dark Brown Hair Color.